Ross Brawn says it is "frustrating" that Formula 1 and Silverstone have so far failed to reach an agreement to save the British Grand Prix. The circuit's contract expires after this year's race and talks on a new deal have stalled. "We want to find a solution with Silverstone," F1 managing director Brawn said. "But we are differing in our views of what's reasonable. "We're not far apart. It's frustrating that we can't find a solution." 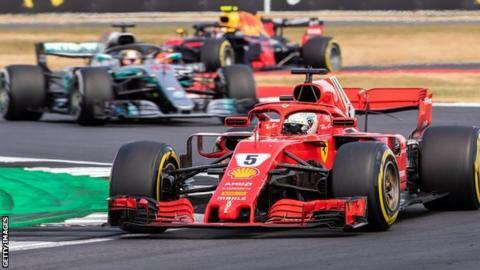 Relations between the two parties cooled further in January when Silverstone managing director Stuart Pringle organised a statement from F1 race organisers criticising the sport's current management. Brawn said that F1 was determined to ensure a British Grand Prix remained on the calendar. He said: "I don't think it will be the final British Grand Prix. Whether that's at Silverstone or not is another matter." And he gave what might be interpreted as a thinly veiled threat that F1 could look elsewhere for a venue by making reference to a time between the 1960s to 1980s when Silverstone used to alternate as the race's host with the Brands Hatch track in Kent. "Racing in the UK is important to us and obviously Silverstone has been the home of the British Grand Prix for the last few years," Brawn said at a pre-season news conference, "but most of us here can remember it being held at Brands Hatch and it didn't seem that strange that we had a race at Brands Hatch one year and Silverstone the next. "We are determined to make sure we keep a British Grand Prix, and hopefully at Silverstone, but there's no certainty." F1's owners, the US group Liberty Media, have considered a race in London, and sources say a street track in the Docklands area, close to where a race in the all-electric Formula E series will be held next year, is under consideration. Brawn said: "London would be a different race than the British GP. It is a city race. There is a place for both. "I don't think it's feasible to have a London race in the middle of London, unfortunately. The chaos and impact it would have would be too severe. But on the periphery of London there are a number of areas that could work. I don't see it as it would necessarily replace the British GP - it would be the London GP." Brawn, who was talking before the start of the new Formula 1 season in Australia on 14-16 March, said he believed Ferrari were in good shape for 2019 after looking strong in pre-season testing. The Italian team have lost out to Mercedes in the past two seasons, despite having a competitive car, after a series of driver and team errors. "Ferrari have looked pretty good from the beginning but they have had a few reliability issues that they need to get on top of," said Brawn. "Mercedes looked a little bit out of sorts but they'll get it sorted out. They are a very strong team and there are some very smart people there and they will work out what they need to do." Brawn was technical director of Ferrari from 1996 to 2006, winning five consecutive drivers' titles with Michael Schumacher from 2000-4, and was team boss of Mercedes from 2010-13. He said he believed Mattia Binotto, who worked under him at Maranello, would be a good appointment as team principal. "I spent some time in the garage [at testing] - nice calm atmosphere, constructive working," he said. "Knowing Mattia Binotto very well, he will bring a very pragmatic… he's an engineer, like me, so he will see things in a certain way. He can get emotional like all of us but he is very structured and I think we are going to see a new calm about Ferrari in the coming season." Brawn said the arrival of the highly rated Charles Leclerc would "be an added element to the dynamic of the team and it's too early to say how that will work". He said this could "unsettle" team leader Sebastian Vettel and "that is the thing the team will have to manage". However, Brawn said he would be "surprised" if Leclerc could beat Vettel in what is only his second season in F1. "Sebastian is more than capable of winning the world championship," Brawn said. "And with the calmness about the team I suspect they'll have, and the car looks good, so I think they have every chance this year." How do F1 teams stand after final test? The UK is due to leave the European Union on 29 March and eight of the 10 F1 teams have bases in the Britain. Last month, Mercedes team boss Toto Wolff said Brexit was "a major concern" and that "any major disruption with borders can massively damage the F1 industry in the UK". Wolff described a no-deal Brexit as "a nightmare scenario I don't even want to envisage" and said the uncertainty around what will happen was "the mother of all messes". But Brawn said he was not worried about the risk to F1 from Brexit. "There will be some bureaucracy that will come from Brexit, which is a bit painful," Brawn said, "but apart from that, I'm sure we can make lots of arguments for the negatives and positives, but F1 teams are pretty resourceful and capable and this is not going to stop them racing."